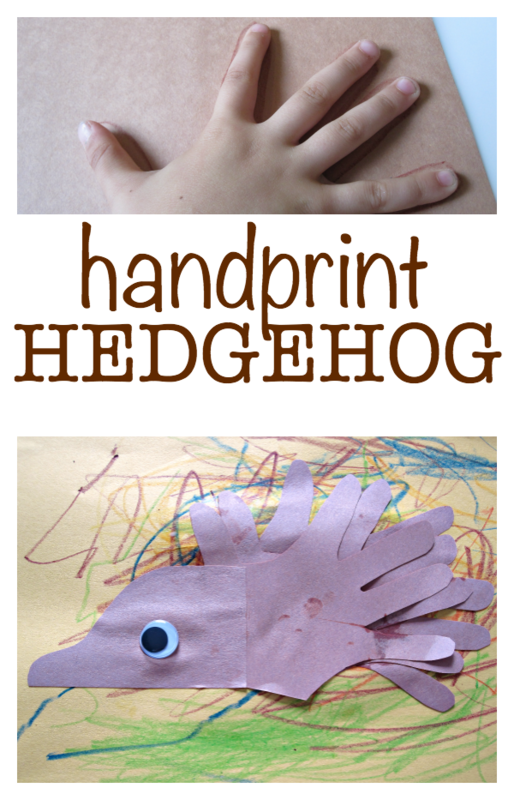 This hedgehog craft was so fun, it’s simple, but we had a great time doing it while Little Missy was swinging in the swing in the morning. 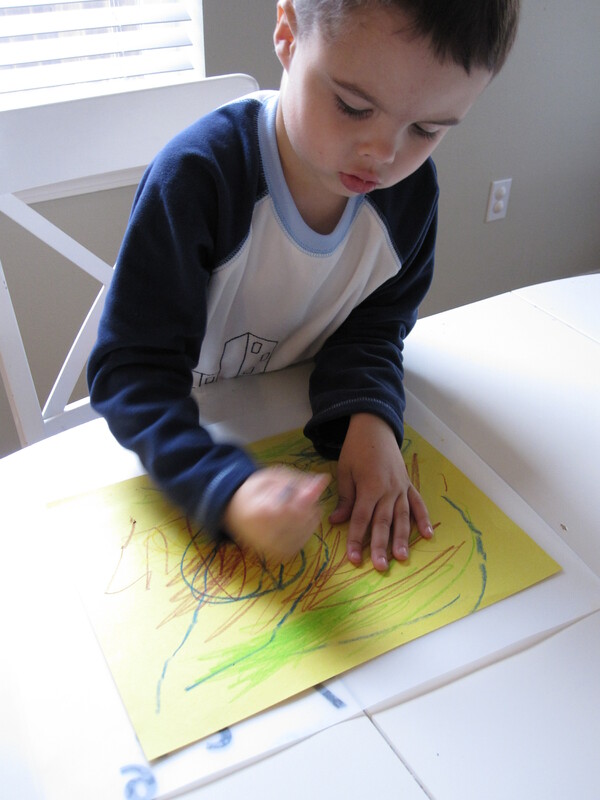 What I really loved was his imagination when I gave him the crayons to draw where the hedgehog lived, it’s habitat ( new word for the day). He made me go get more crayons for different things like grass, water and toys. 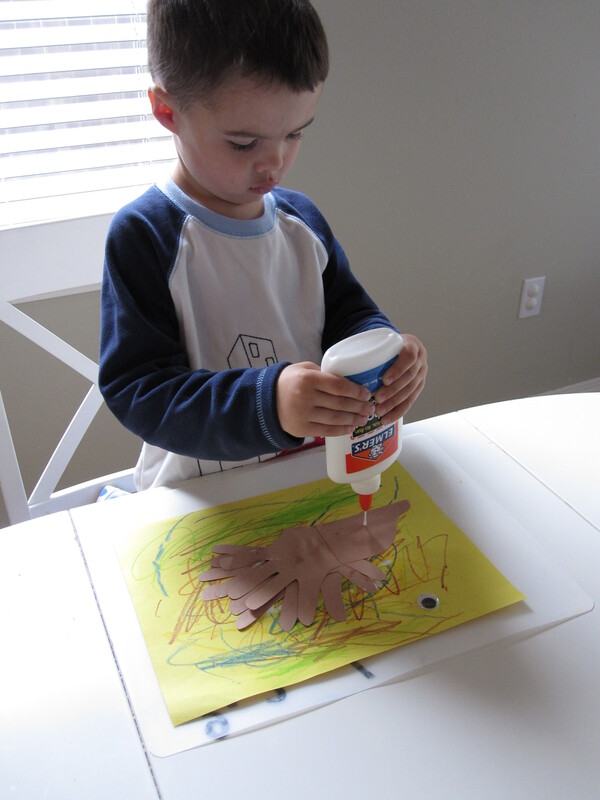 It would be cute to make a whole family of them with your hand prints too! Gather your materials. 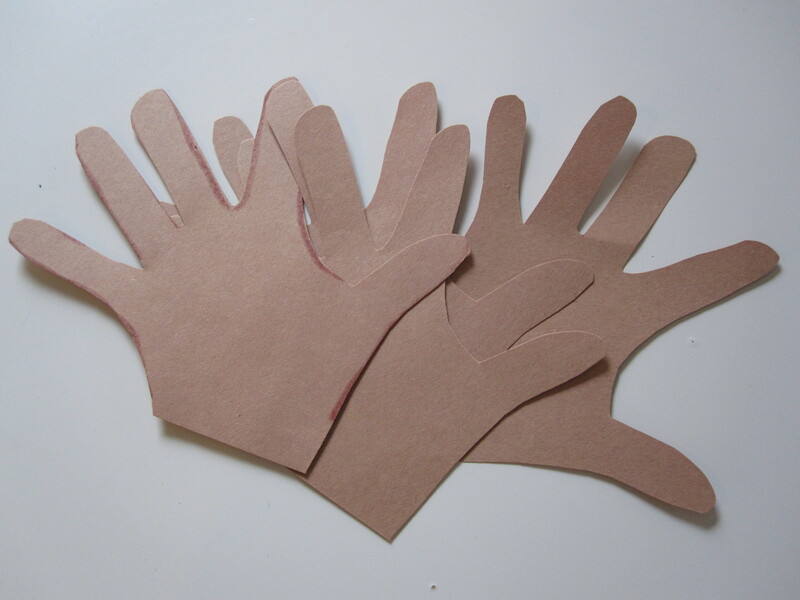 You will need 2 colors of construction paper, I used 2 sheets of brown because my guy has insane long fingers and one yellow. 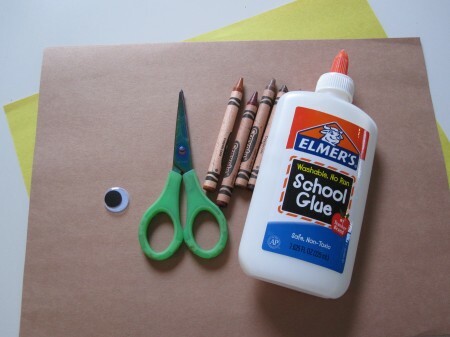 Also some crayons, glue, scissors and one googly eye. 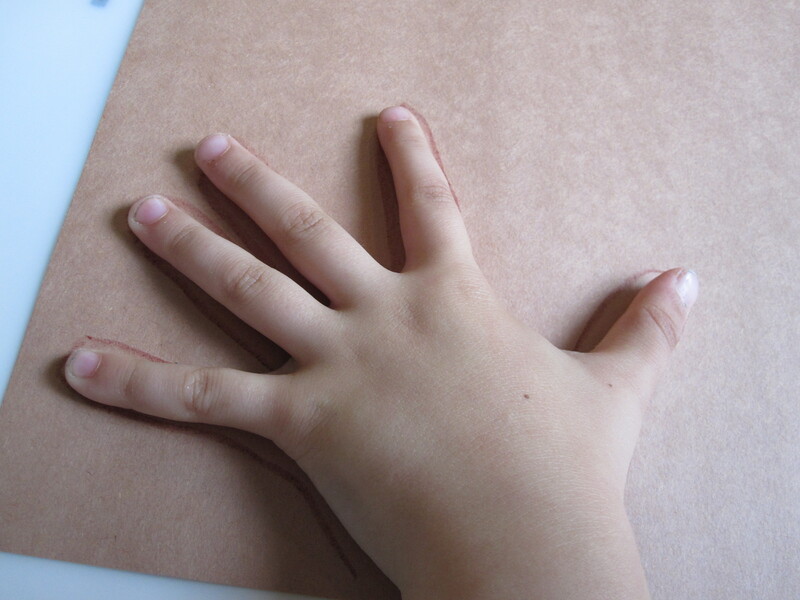 Start by tracing your child’s hand. I find it easier to trace once, and fold the paper into layers to cut the number I want out. 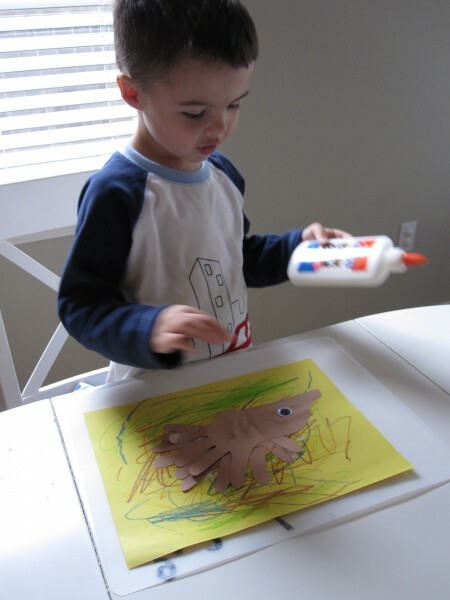 Hand your child the crayons and sheet of paper to draw the hedgehog’s habitat. New vocab word slipped in there! 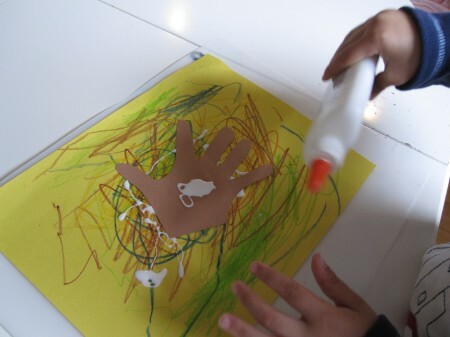 Cut the hand prints out while they draw. Add a hand or twoAdd more for the next layer if need be. Add the glue for the eye. 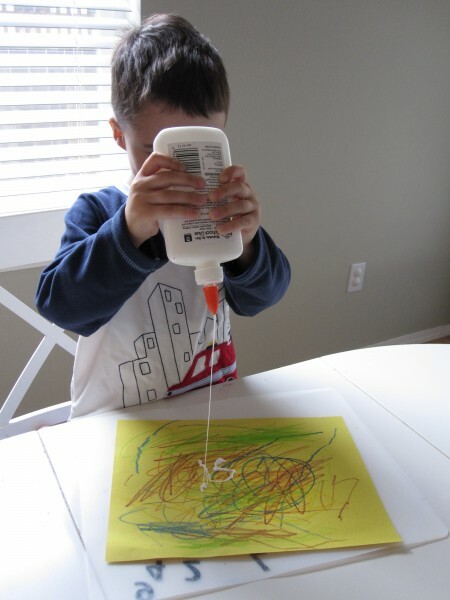 Add the eye and let dry! WHAT? Maybe I am just paranoid ( I tend to be a little over safety conscious, especially in the first few months postpartum ) but really? I immediately started to say something to my son about it and he chimed in saying that he wouldn’t want to stay at someone else’s house. Not saying he wouldn’t but that he wouldn’t want to. I told him that it’s not a good idea and luckily we have phones unlike Hedgehog and we can ask a nice person to call for help or better yet find/call a police officer. Don’t even get me started about the subplot of the seemingly adult male pig falling in love with this little-lost pig too. The book was originally written in Swedish and I keep thinking that perhaps the story was lost in translation? Perhaps. 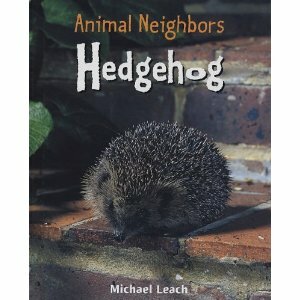 Hedgehog (Animal Neighbors) by Michael Leach is a great resource about these spiky little creatures. My son and I learned so much neither of us knew about hedgehogs. Did you know baby hedgehogs are called hoglets? The book has a good mix of pictures, illustrations and short pieces of text filled with facts. 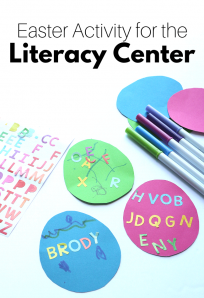 The short paragraphs of text are perfect for little guys who aren’t ready for a full book but want to learn more about the subject, parents can pick and choose which tidbits to share while exploring the pictures too. Previous Post: Sunday Best Meme : Link Up ! I agree – that book sounds crazy. Hopefully, you are right and the translation was a problem. As far as hedgehog books go, we also like Hedgie’s Surprise and Hedgie Blasts Off – both by Jan Brett. .-= Christy´s last blog ..Tie Dye Milk =-. I’ve collected hedgehog since highschool (I grew up in England where we would see hedgehogs in our gardens sometimes, and it was a nickname my friend gave me) so tend to gravitate toward books and crafts involving them. I think we’ll have to try this. Love the Jan Brett books — got the Hedgie Blasts Off one from the library because my husband is a big Sci-Fi/Fantasy book reader so I thought he’d enjoy reading it too. That was pretty popular with the whole family. We had Hedgehog, Pig and the Sweet Little Friend out of the library also and my daughter was obsessed with it, she loooved it and didn’t want take it back. She tends to like poem texts which I think was a big part of it. We have another about Hedgehog called “Tea for Ten” which is much simpler (and she doesn’t have a baby yet in that one) – hedgehog is at home feeling lonely then her friends drop in counting up until there are ten, then they all go out to see a movie. 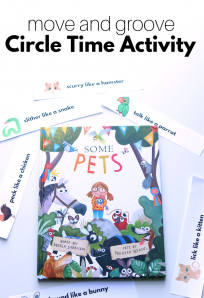 Apparently there’s also one by the same author called “Tick-Tock” that helps with the concept of telling time and then “Hedgehog’s Secret” in which it sounds as though she spends the book nesting and telling her friends she’s too busy to do the things they’re asking her to do, and then at the end of the book everyone coos over her new baby?! 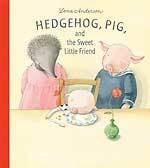 I think all except Hedgehog, Pig and the Sweet Little Friend are out of print though. I do tend to use books where the plot makes me uncomfortable to start conversations – so in this case, what would you do if you were lost? I usually tell her that if we’re out and get separated in a place where she can’t find a police officer or go to a checkout counter the next thing to do would be to look for another family and ask the mum/dad for help so I guess if you’re walking on a dark street alone (God forbid that should ever happen) looking through the windows to find another mum to ask for help would be the best option? But then what to say, don’t go in the house and ask the mum to call and ask the police to come and help (assuming the child can’t give enough info to call the parents directly)? I don’t remember what exactly we talked about when we first started reading this one though, but we were reading AA Milne’s poem “Puppy and I” the other day and she stopped me to tell me that the boy probably shouldn’t have talked to the man since “he didn’t know whether he might be mean” which presumably means she has some sense of being cautious of strangers. .-= commonplaceiris´s last blog ..Kids Clothing Challenge Update =-. I agree with your take – I was just taken aback , I think I was expecting something else. You have great suggestions on how to turn a book into a lesson . 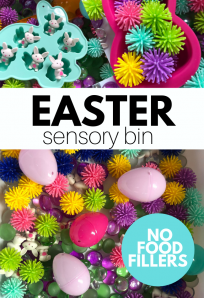 .-= Jenae @ I Can Teach My Child´s last blog ..Woombie Winner &amp Discount for All! =-. I’ve been trying to order some things from Constructive Playthings and ran into some trouble… apparently they have two web sites, one for parents and one for schools/daycares. But a parents are allowed to order off of the school site, too. 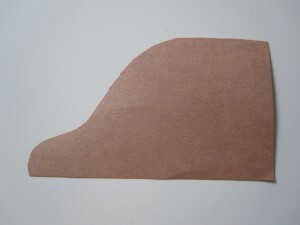 I was trying to order construction paper, b/c they offer it in packs of 50 of individual colors for $.95. At the rate we use paper, this is a much better deal than buying a little multipack from walmart! 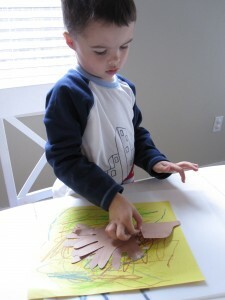 :o) But they only offer construction paper that way from their school site, cptoys.com. Your 15% off button takes us to constplay.com. Sooo, I was wondering if you knew if there was a way to get the 15% off no matter how you ordered… since it’s all Constructive Playthings. :o) Do you know of a code that I could enter at checkout? You might not know of a way, but I just thought I’d try. It seems a little sneaky of Constructive Playthings, otherwise! :o) Thanks for your help! .-= Laurie´s last blog ..Afternoon Nap Fail =-. Laurie I will forward these questions to the company asap – and get back to you ! I ended deciding to go ahead and fill my shopping cart with things I wanted from the constplay.com site (the link from your blog), and that way i’d have it ready to go. 🙂 But for some reason their site wasn’t working… it would search and search for the item # I typed in, and then eventually just give me a blank screen. So I called Constructive Playthings customer service to tell them their site wasn’t working, and they had me order over the phone, and they gave me the 15% off on everything. Strange that over the phone they don’t know which catalog you’re ordering out of, so I ended up getting the 15% off with no trouble… except for the 45 minutes on the phone/on hold while they figured it out! I even got to talk to an IT guy to explain the web site troubles, haha. Thanks for your help–sorry I made you do some extra work and then got it taken care of myself! I’m so excited about all the learning activities I’m getting. Thanks again! !